As we discussed in the overview of the Cubs’ farm system, we’re going to start out today seeing that the system is still down. There are a lot of fringe guys at the bottom of the system, players who make the list either because of unexpected standout performances or a standout tool that leads to inclusion despite other flaws. But before we finish off the bottom fifteen, some of the upside you really hope to see in this bracket of prospect rankings is going to emerge. I have not included as much information on each player as I do in the pre-season version for one simple reason – I have more time on the pre-season version. I have, though, tried to include a short glimpse into how the player is doing this year, why he made the list, where we can expect him to go from here, and when, if things go well, he could land in the majors. Please note that just because I list a projected major league arrival date does not mean I expect all of these players to reach the majors. Most of them won’t, and we know that. I’m just charting what the course is likely to look like *IF* the player manages to stay on a major league path. We start with a string of outfielders, including an undrafted free agent. 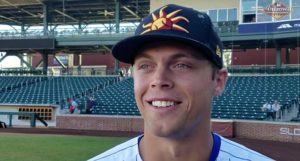 Fennell was signed as a non-drafted free agent, one of several signed by the Cubs this year who have been playing well in the lower levels of the farm system. He played 20 games for Arizona to start his professional career, and hit .355/.417/.592 with one home run in the process. The Cubs moved him to Eugene, and so far it has been more of the same (.311/.338/.500 with 2 home runs). That said, his strikeout rate jumped up to 27.3% with Eugene, and that will have to come back down if he’s going to find any success up the system. There were a lot of guys I could have put in this fortieth slot, but I chose Fennell not just because of his production (which is very good for a guy just starting his career), but also because he is a non-drafted guy. He’s already had to catch the Cubs’ attention the hard way just to get into an organization, and once there he had to find playing time despite all those guys who were drafted typically getting priority. And he’s done that. That’s not easy, and I think that bodes well for his chances to make the necessary adjustments to keep moving up the system. Look for Fennell to open 2019 in South Bend. Kelli dominated the Dominican Summer League a year ago, but his transition to the Northwest League has not been as smooth. Instead of hitting over .300 with an on base percentage over .400, he’s hitting .218/.295/.247. His strikeout rate is a scary 28.4%, and his nonexistant power isn’t helping him maximize the contact he does generate. But he still makes this list because of his base stealing. Kelli might be the best base stealer in the organization, major leagues included. He is simply fantastic on the basepaths, and if he can adjust his game to allow him to keep getting on base so his speed can play, he’ll be an asset. Can he do it? No idea. But the potential here is so high he creeps into the back of the Top 40 despite having one of the worst lines I’ve ever ranked. It would be pointless to talk about when Kelli could make the majors right now. I’m not even sure he’ll make it to South Bend to start 2019. I hope he does, because when this guy gets on base he is fun to watch. Caro has been in the farm system since 2012, but this year something clicked. He opened the season in South Bend, but stayed there just 38 games after hitting .375/.460/.555 with 17 steals. His line hasn’t been much different in Myrtle Beach (.355/.437/.468), and he is still piling up the steals. I’m not sure what allowed this switch-hitter to suddenly start consistently squaring the ball up and spraying line drives all over the diamond, but I suspect it is sustainable and won’t simply vanish as he moves up to Tennessee. Caro should get that shot at Tennessee next season, and I like his odds of doing well there. If he does, the Cubs may need to fast track him to the majors… if he is still a Cub. A high on base percentage, switch hitting, base stealing outfielder is exactly the kind of guy a team could hide on their bench as a Rule 5 draftee, and Caro will need to be protected. I doubt the Cubs add him to the 40 man, and that means teams will have to decide if it is worth the risk of jumping him up from A ball. If he does stay with the Cubs, he could be pushed through Tennessee to Iowa in a hurry next season. Craig Brooks was drafted in 2015, and at every single stop on his journey up the system he posted a K/9 greater than 10. Every stop, that is, except Iowa this season where that figure is down to 8.79. Still, 2018 came with a breakthrough for Brooks when he opened the year in Tennessee. Not only did he post his typical, excellent strikeout rate, he also held the walks to just 2.70 BB/9. That figure also slipped in Iowa… badly. Through 14 innings in Iowa his walk rate is a grotesque 11.93 BB/9. But I don’t think it will stay there. Once Brooks sorts out his control snafu in Iowa, he could be ready for the majors at anytime. His high strikeout stuff should play just fine in the middle of a bullpen, and as a member of the Iowa Shuttle Crew he could get that shot sometime next season. I don’t know that he has upside beyond a middle reliever, and I lack hard data on the quality of his individual offerings to speculate, but I think we’ll get a chance to see his stuff for ourselves with the full benefit of PitchFX data just as soon as he gets the call to Wrigley one day next summer. At times Assad has looked like one of the better pitchers in the lower minors, particularly last season when he was striking out batters at almost a 10 K/9 rate while posting a very good 50% grounder rate. This season those numbers are down to 7.60 K/9 and 44% ground balls, but the results have still been there. Assad doesn’t walk many, is fairly stingy with the homers, and in general just gets his innings and keeps the Cubs in the game. What makes him hard to project is that, given the dramatic drops in K/9 and GB%, I suspect the Cubs have him focusing on developing one of his secondary pitches right now and he isn’t using one or more of the out pitches he used last season as a result. The Cubs do this all the time, particularly in the low minors, but they rarely announce it. That means I hesistate to project Assad based entirely on his 2018 numbers because I might be projecting based on only part of his arsenal. So let’s just say that Assad has mid-rotation upside but comes with quite a bit of risk, and that he probably isn’t likely to see the majors until late 2021 at the earliest. The Cubs eleventh round pick in 2016, Rucker has all the earmarks of a quality number five starter. His strikeout rate is good, but not great (8.35 K/9), his walk rate is just plain good (2.45 BB/9), and his ERA reflects that. On the down side, he isn’t much of a groundball pitcher (35.3%) and is prone to the long ball (15 homers in 21 games). He has been durable, though, pitching 105 innings last year and on track for about 120 this year. I think we can go ahead and pencil Rucker in as part of Iowa’s rotation in 2019, and from there we can just see how the competition develops. 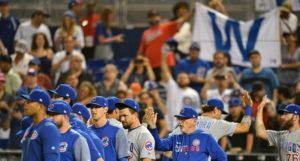 There should not be many rotation slots open in Wrigley over the next two years, and there are a lot of pitchers pushing into the upper part of the system. If the Cubs opt for upside, Rucker may be in for a long wait. But if they need a guy who can reliably pitch five innings and probably keep the team in the game, then his number may well be called. A product of the 2016 draft, Short has been in and out of the closer role as he has shot up the farm system. He was very good in Myrtle Beach to start 2018 (10.80 K/9, 55.6% ground ball rate), but has appeared to stuggle a bit with Tennessee since being promoted (4.91 ERA, 6.00 FIP). I’m not sure that appearance reflects reality. His strikeout rate is still good (9.33), his walk rate is on the high side, but ok for a good reliever (3.93), and while his ground ball rate is down, 50% isn’t an issue. What is an issue is his 1.96 HR/9 driven by a laughably high 23.5% HR/FB. His previous career high HR/FB was 4.8%, so I suspect some bad luck is skewing his Tennessee results right now. Short appears to be one of the best lefty relievers in the upper part of the system, and I think he’ll move on to Iowa no later than the middle of next year. I don’t know that he has closer potential in the majors, but as a groundball pitcher who can get strikeouts I do think he could work full innings in the middle of the bullpen, and probably compete for some eighth inning assignments one day. I’m ranking him here partly because I’m just not sure he’ll be a high leverage guy, and partly because that high home run rate in Tennessee might not just be bad luck. Reynolds was just drafted in June, and already he shows signs of being a fast moving bat. He is clobbering Short Season A to the tune of a .313/.408/.469 line. The walk rate is excellent (13.6%), and even though the strikeout rate is high (25.0%) I’m not too worried. I really don’t think Reynolds is being challenged right now. He’s making an out in less than 60% of his trips to the plate; that’s not a bad thing regardless of the strikeout rate. Reynolds might jump to High A Myrtle Beach to open 2019, and from there the Cubs will likely let him move as fast as his bat will take him. If the walk rate stays up, the strikeout rate remains tolerable, and he keeps posting good power numbers, Reynolds could be in Double A by 2020. As for how he projects, let’s see how he does once he finds a league that can challenge him before we work that one out. Giambrone was drafted in 2016, so despite his age he is making very good time through the farm system. This has been a pretty significant breakout year for him, though, as he has set career highs in SLG (.469), HR (16), and steals (22). His flyball rate has jumped by ten points this year, all the way up to 43.4%, and I strongly suspect that is responsible for the uptick in power. Suddenly Giambrone looks like a potential 20/20 infielder, and that could be good enough to start for some teams at second base. The Cubs have moved Giambrone all over the diamond (although second looks like his best fit), and I suspect his initial path to the majors will be as a utility player. A utility player who can hit plenty of homers and steal some bases should get plenty of playing time, though, provided he isn’t overly held back by his OBP (.321 this year). He should move to Iowa next season, and once he has his feet wet at that level he could get the call to Wrigley at any time. Monasterio is a pretty good up the middle defender, and he shows plenty of promise at the plate. He gets on base at a very good rate (.370 this year), but a lack of power is holding him back overall (.345 SLG). That said, he is hitting fly balls at a career high rate this season (44%), so it is possible that he has some swing changes in the works in an effort to unlock a little more power. If he does, Monasterio could easily be yet another well rounded, well regarded utility infielder. I don’t think he has anything left to prove in Myrtle Beach, so I would look for him to move up to Tennessee next season. If he can push his ISO over .100 while in Double A, pencil him in for a 2021 major league arrival. If not, his career path may slide more towards that of a flexible minor league veteran rather than a versatile major league utility player. Vosler is a left-handed slugging third baseman. It took him a long time to shake free from Tennessee despite a wRC+ of 125 in 129 games there in 2017 and 129 in 66 games this season, but so far he has adapted quickly to Iowa. Through his first 37 games his wRC+ is 105 and likely to rise before the end of the season. Strikeouts are a concern (32.9% K% in Iowa), but so far he has managed to adjust and bring his strikeout rate back down to a reasonable level with time. I wouldn’t be at all surprised if that figure was closer to 25% this time next season. But I don’t think he’ll be with the Cubs no matter what it is. Vosler will need to be protected from the Rule 5 draft this winter, and I don’t think the Cubs will be able to spare a 40 man roster slot for a third baseman given the infield depth they already have. I suspect someone will take a look at the success of bats developed by the Cubs and take a shot on Vosler, if he isn’t traded first. Should a situation appear, he could head for the majors as soon as September, and could probably hold his own in a part time role. If you could custom order a minor league hitter, you might get Jared Young. Left-handed swing? Check. Healthy strikeout rate? Check (16% in SB, 19.1% in MB). Good power? Check (10 HR in SB, 4 HR in MB). Positional flexibility? Check (he’s played four positions since being drafted). I guess we could ask for a bit of a higher walk rate (6.8% in SB, 7.3% in MB), but the trend line is in the right direction and he’s posted OBPs over .360 at both stops this year. I really can’t complain. The only real knock on Young is his age, and even that isn’t his fault. He was drafted in 2017, and he’s now made it to High A in the season after being drafted. We really can’t ask for a faster track from a 15th round pick. I think the Cubs will get him into Tennessee fairly early in 2019, and then we’ll find out just how good his bat can be long term. I suspect Young is going to add his name to the list of good offensive utility players produced by the farm system, and that he may get his chance to fill that role in Wrigley as soon as 2020. Wilson is a gifted defensive outfielder who could emerge as a true leadoff candidate in the majors one day, if he can stay healthy. His career high for games played in a season is 91 (set last year), and DL stints this season means he won’t match that figure in 2018. At this point what Wilson probably needs most is just consistent playing time, but injuries keep getting in the way. At his best, Wilson features good plate discipline and plus speed, a combo that allows him to get on base at a respectable rate and do some damage once he is there. He doesn’t project to have much power, but he did hit nine homers for South Bend a year ago, so there should be enough strength in his bat to send line drives into the gaps. There really isn’t anyone blocking him in Tennessee, so I wouldn’t be surprised to see Wilson move on up to Double A next season. If he can finally stay healthy and start cutting back on his strikeout rate, he could move up the prospect charts fairly quickly. He has major league starter upside, but the injuries are keeping his stock depressed for now. I can see a scenario in which he makes the majors in late 2020, but 2021 is a safer bet. Hudson was one of the first of new wave of curve-centered pitching prospects, and he still has one of the higher ceilings. Unfortunately, he hasn’t really taken a serious step towards that ceiling. This year, for example, the walk rate has ticked up (to 5.09 BB/9), the ground ball rate is down (although 54% is still pretty darn good), and the modest increase in strikeout rate (to 6.36 K/9) hasn’t offset all those extra base runners. He’s pitched some excellent games, but he has also pitched some very not excellent ones. The Cubs crowded pitching situation could squeeze Hudson out of a shot at the Tennessee rotation in 2019. That means he could either head to the bullpen or stay in Myrtle Beach. My guess is he stays in the Myrtle Beach rotation to open the year, hopefully finally starting to translate his good curveball and very good sinking stuff into consistent outs. I still like the upside here, but we should probably shift his projection back to a potential number five starter or a middle reliever. I don’t see Hudson reaching the majors until 2021 at the earliest. Steele left Myrtle Beach to have surgery after 98.2 innings last year. He was having a nice year when he left (2.92 ERA), but none of his peripheral stats stood out. When he starting making rehab appearances in Mesa, though, Steele suddenly morphed into a strikeout machine. His 13.25 K/9 was the best of his career, as was his 1.96 BB/9 (by a wide margin). He’s made it back to Myrtle Beach now and so far the strikeouts are continuing to pile up. We don’t know if this is a small sample size thing or if perhaps he learned to better use his stuff while on rehab and has stepped his game up dramatically as a result. By this time next year, we should now. Steele projected as a back of the rotation starter before he was hurt, so we’ll stick with that until we see whether his new strike-throwing abilities are going to hang around. He should head to Tennesee at some point next year, and if he can stay healthy and get his inning counts built back up he could be an option for the back of the Cubs rotation or as a long relief guy by the end of 2020. 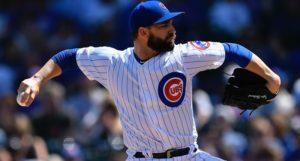 Next Post Next post:Chicago Cubs Lineup: Bote Is Batting CLEAN UP! This is Not a Drill!